We kick off a new week of news here on Boardseeker with all the latest from the PWA. The first event of the year is well under way in Reggio Calabria, Italy. The wind hasn\’t quite turned on enough to get the slalom sailors afloat, with only one heat for the ladies completed so far with local sailor Laura Linares taking the win. Fingers crossed for some more wind in the final two days, be sure to keep an eye on the action on the PWA website. A spot of video action from Bonaire now. Youp Schmit is one of the youngest riders on the tour, but definitely has the skills to take on the top freestylers. In this cool clip from last month, check out Youp tearing it up on the crystal clear Caribbean waters. UK Freestyler and rising PWA star Max Rowe recently ran an U-17 coaching weekend at his home spot on Mersea Island.“The idea of the day was to hopefully inspire some kids that are already blasting along to keep pushing themselves and to get them trying some freestyle as well. It was great to go back and see so many keen kids down there getting into it!” It sounds like the weekend was a great success, you can check out the full write-up on our sister site Boards.co.uk. Pozo young gun Alessio Stillrich has updated his blog with news from some recent sessions. The summer wind is kicking in on Gran Canaria as Alessio launces into some epic jumping on his 3.4 and 3.7m sails – check out his BLOG for more news. Sa Barra on Sardinia delivered some ferocious freestyle conditions over the Easter weekend, with top riders Adrian Beholz, Mattia Fabrizi and more getting in some training. With the PWA event in Austria kicking off on Friday, these two are definitely going to be ones to watch. 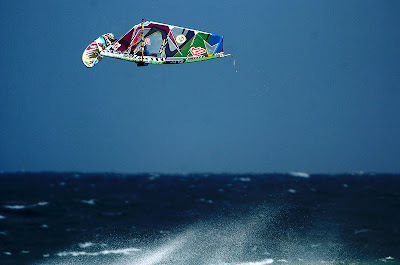 Check out a great selection of photos on WindsurfNews.de. Zakel.ws have shared a great interview with Paul Zeper. As one of the driving forces behind Hot Sails Maui\’s new \’Freestyle PRO\’ sail, Paul talks candidly about the development and features of the sail, his time on Maui and his views on the windsurfing industry. Click HERE to check it out. The American Windsurfing Tour catch up with one the youngest sailors on their tour. \’Rider of the Week\’ for the AWT is Fiona Wylde, and at 15 years old she is already ripping. Keep an eye on Fiona on this year\’s tour, which kicks off in Santa Cruz on May 3rd. Read the interview HERE. Our AM update wraps up with an interesting video from Sophia Regerbis. Thomas Traversa prepares for the port-tack world tour with some starboard-tack training at home in France. “Training is useless unless you have a purpose…” With a personal trainer like that, Thomas is sure to cause some upsets on the PWA this summer!